Millioke is in the heart of downtown, located in the brand spankin’ new Marriott building at 323 E. Wisconsin Avenue. TJ pointed this place out to me a while ago, because he was actually impressed with the logo. It fell off the radar until we recently played the “I don’t know. What do you want?” game, we decided to try it out. Instead of a booth, we chose a bar high-top table but moved over to the actual bar when two spots opened up. The menu stated “house made mix” so I opted for their bloody mary, even though it was 6PM. TJ got a beer, we ordered some appetizers and we were set. Mix: My first few sips of the Bloody were very impressive. I noticed little chunks of bacon floating at the bottom but didn’t seem a lot of other spices. It had a smokiness to it, which I gathered to be from the bacon. There was a bit of a kick, but the bacon flavor definitely over powered. TJ gave his seal of approval, too. When we moved to the bar, I struck up a conversation with the bartender after I overheard him and the manager discussing the type of bacon used for infusing (bits vs. stripes, FYI) the vodka. This is when Millioke let me down. Folks, I’ve been lied to. The menu stated house made mix, but the bartender spilled the secret of using Zing-Zang. He said it’s too much work to make their own mix. What! Millioke… I’m not sure where you’re coming from but take a stroll down the street. There are restaurants much larger than this who hand craft their own mix daily. I’ve worked in restaurants and bars; I realize it’s hard work to maintain freshness and consistency. That’s not my issue. Here’s my issue: don’t print “house made mix” on the menu when it’s not a house made mix. In Milliokes defense, part of the mix is home-made. They really infuse their own bacon flavored vodka in-house. “Marketing”, he says. “Liars”, I say. Garnish: The garnish at Millioke was very simple. The celery was tall and fresh accompanied by a small slice of sausage and cheese cube. What about some bacon? They used it all up in the infuser, maybe. Price: For a bottled mix, this was maybe a bit expensive. The total cost was $9, but I don’t think it ranks that high. Lowlands Group average at $8, made their own mix AND garnish wonderfully. Since the size was close to 20 ounces, I suppose it levels out fairly. Size: This was a large bloody. It came in a tall pilsner glass which is probably close to 20 ounces. Buzz: Given the size, yes, the buzz was high at Millioke. It was just above the bar where you the voice in your head saying “you’re not hungry anymore”… isn’t there. I finished off our chicken wings (which were awesome) and the large pretzel we got and waddled home. Then took a nap. Final words: I really like Zing-Zang. My #1 recommendation for people looking for a store-bought option is 1/2 ZZ, 1/2 Jimmy Luv. However, had I known Millioke uses Zing-Zang, I wouldn’t have had the bartender make a bloody mary for me on a Saturday evening. I’d recommend Millioke for some quick appetizers if you’re staying in the area or at the hotel. It’s usually a bummer when you find out a bar serves a ready-made mix. Zing-Zang is one of the best at least. And at least the High Life pony was a bonus right? 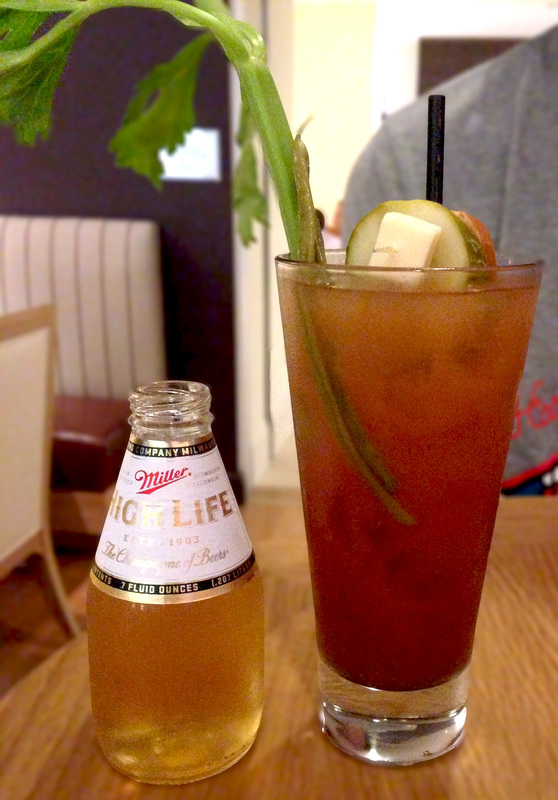 This entry was posted on July 24, 2013 by Shannon in Bloody Marys in the area and tagged Bacon, bacon infused bloody mary, Bloody Mary, Infused Bloody Mary, Marriott, Millioke, Milwaukee, Zing-Zang.